The sensor on your digital camera picks up a lot more than just the light that’s visible to the human eye. Camera manufacturers go out of their way to reduce this to just the visible spectrum in order to produce photos that look right to us. But, what if you want your camera to take photos of the full light spectrum? This is particularly useful for astrophotography, where infrared light dramatically adds to the effect. Generally, accomplishing this is just a matter of removing the internal IR-blocking filter from your camera. 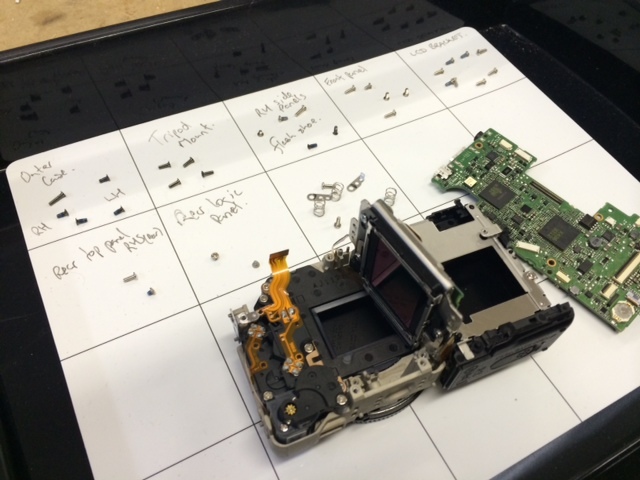 However, most of us are a little squeamish about tearing into our expensive DSLRs. This was the dilemma that [Gavin] faced until a couple of years ago when he discovered the Canon EOS-M.
Now, it’s important to point out that one could do a similar conversion with just about any cheap digital camera and save themselves a lot of money (the practically give those things away now). But, as any photography enthusiast knows, lenses are just as important as the camera itself (maybe even more so). So, if you’re interested in taking nice pictures, you’ve got to have a camera with an interchangeable lens. Of course, if you’re already into photography, you probably already have a DSLR with some lenses. This was the case for [Gavin], and so he needed a cheap digital camera that used Canon interchangeable lenses like the ones he already had. After finding the EOS-M, the teardown and IR-blocking filter removal was straightforward with just a couple of hiccups. When [Gavin] wrote his post in 2014, the EOS-M was about $350. Now you can buy them for less than $150 used, so a conversion like this is definitely into the “cheap enough to tinker” realm. Have a Nikon camera? The Nikon 1 J3 is roughly equivalent to the original EOS-M, and is about the same price. Want to save even more money, and aren’t concerned with fancy lenses? You can do a full-spectrum camera build with a Raspberry Pi, with the added benefit of being able to adjust what light is let in. If you are someone whose interests lie in the field of RF, you won’t need telling about the endless field of new possibilities opened up by the advent of affordable software defined radio technology. If you are a designer or constructor it might be tempting to believe that these radios could reduce some of the problems facing an RF design engineer. After all, that tricky signal processing work has been moved into code, so the RF engineer’s only remaining job should be to fill the not-so-huge gap between antenna and ADC or DAC. In some cases this is true. If you are designing an SDR front end for a relatively narrow band of frequencies, perhaps a single frequency allocation such as an amateur band, the challenges are largely the same as those you’d find in the front end of a traditional radio. The simplest SDRs are thus well within the abilities of a home constructor, for example converting a below-100kHz-wide segment of radio spectrum to the below-100kHz baseband audio bandwidth of a decent quality computer sound card which serves as both ADC and DAC. You will only need to design one set of not-very-wide filters, and the integrated circuits you’ll use will not be particularly exotic. But what happens if the SDR you are designing is not a simple narrow-band device? [Chris Testa, KD2BMH] delivered a talk at this year’s Dayton Hamvention looking at some of the mistakes he made and pitfalls he encountered over the last few years of work on his 50MHz to 1GHz-bandwidth Whitebox handheld SDR project. It’s not a FoTW in the traditional sense in that it is not a single ignominious fail, instead it is a candid and fascinating examination of so many of the wrong turnings a would-be RF engineer can make. The video of his talk can be found below the break, courtesy of Ham Radio Now. [Chris]’s talk is part of a longer presentation after [Bruce Perens, K6BP] who some of you may recognise from his activities when he’s not talking about digital voice and SDRs. We’re jumping in at about the 34 minute mark to catch [Chris], but [Bruce]’s talk is almost worth an article in itself..
Latvian artist [Krists Pudzens] just put on a show in Sweden and sent us the video of his amazing kinetic sculpture. (Embedded below.) We found an arty-theory writeup of another exhibition of his to share, but we had so many technical questions that we had to write him back asking for details. And boy, did he answer. 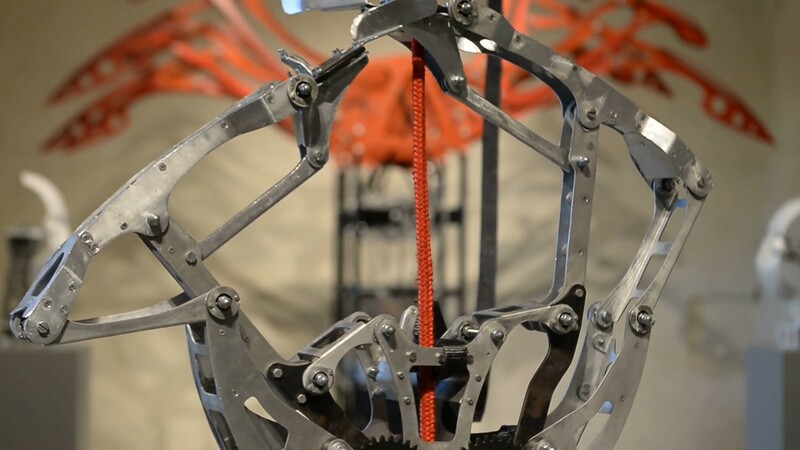 In the video, a couple of animatronic faces watch you as crab-like rope-climber bots inch upwards and red wings flap in the background. There’s a lot of brilliant mechanisms here, and aside from whatever it all means, we just like to watch machines go. The details! Most of the pieces are plasma-cut steel or hand-cut-and-filed aluminum, and almost all of the motors are windshield wiper motors from old Russian KAMAZ and LADA cars. In another installation, the red wings (“Red Queens’ Race”) were installed in a public square and used to track the crowd, flapping faster as people moved more quickly by. The robotic faces also use OpenCV to track you, and stare you down. One mask is vacuum-formed plastic, and the other is a copy in polyester resin and gelcoat. Here is a video of them on their own, and another of the development. The twin rope-climbers, “Unbalanced Force”, just climb upwards at different paces. We were more than a little curious about what happens to the rope-climbers when they reach the top. [Krists] says the gallery staff grabs ladders and goes to fetch them. When he exhibited them in Poland on 20m ropes, they actually had to hire professional climbers. Life imitates art. Some of us here at Hackaday are suckers for tech-art, whether it’s 3D-printed baroque columns, dancing with metal-bending machines, or just glowing globs of ferrofluid. There’s a lot of the same “wonder what would happen if…” tendency in the hacker and the artist — seeing possibilities and making them real. In the previous article in this series on making a personal electronic project into a saleable kit, we looked at the broader picture of the kit market for a new entrant, the importance of gauging whether or not your proposed kit has a viable niche and ensuring that it has a good combination of buildability, instructions, and quality. In this article we will look at specifying and pricing the hardware side of a kit, illustrating in detail with an example project. The project we’ve chosen is a simple NE555 LED flasher which we haven’t built and have no intention of assembling into a kit for real, however it provides a handy reference project without the circuit itself having any special considerations which might distract from the job at hand.